Bees need to be fed with sugar when the conditions are not favorable for them to gather their own food due to dwindling supplies, such as in the winter season. It is during this feeding season that bee hive feeders have to be used. The essence of the bees storing honey in their hives, is to provide them with food during winter or when there are very little or no available flowers for nectar available. You will usually find bees eating their honey stockpiles when they cannot get nectar. This is the time the beekeeper needs to keep a close watch on the hive, because after their honey stockpiles is all eaten up, the possibility of starvation becomes inevitable. Bees can be kept alive for long periods simply by being fed quality white sugar. The bees can be moved to a new location where plants yield nectar. Alternatively the bees can be fed using white table sugar, or syrup made of white sugar. Note: raw sugar, brown sugar and molasses should never be used to feed bees as these could cause dysentery. When feeding, bees never place the sugar syrup in the open as this could leave the food accessible to other bees from other hives or untamed colonies to come and compete with your bees. The result of this may cause infection to your bee colony. The best time to feed the bees is in the evenings, as this will minimize the possibility of stray bees feeding on food meant for your bees. When giving your bees food, it is best to place it right inside of the hive. There are various types of bee hive feeders, and beekeepers are at liberty the one that will best suit their unique needs. It must also be noted that it is through the use of bee feeders that beekeepers can administer medication to their bees by mixing medicine with the sugar syrup. 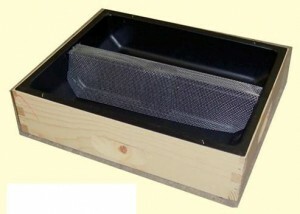 The bee hive entrance feeder, also referred to as the ‘boardman’ feeder, is the most popular bee feeding equipment. It consists of a small jar, (which the feeding is put into) sugar syrup, that is placed upside down on the base just at the entrance of the hive. The advantage of this kind of bee feeder is that it is cheap and simple to use. Most bee hive kits usually come with this kind of feeder. The proximity of the feeder to the entrance of the hive has the possibility of influencing other bees from other colonies to come and steal the feeding from your hive. It is difficult to administer medication to your bees via the feeder because the equipment is left under the sun. When the feeder is exposed to hot sun, then the feeding might get spoilt. The small jar that is placed at the hive’s entrance needs to be refilled daily. It is not advisable to use this kind of feeder during spring as it will not be as effective. This is due to the fact that the entrance feeder is usually placed at the bottom of the hive, and during spring most bees like hanging on the upper part of the hive. Beekeepers using the entrance feeder are at an increased risk of getting stung by guard bees especially when they need to refill the feeder. Wear a beekeeper suit to protect yourself from getting stung. 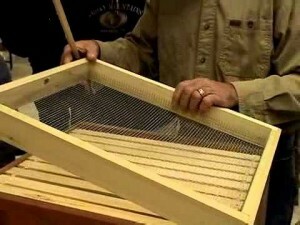 The honey bee board feeder is also referred to as the candy feeder. These are usually spare internal covers of the bee hive that are changed into sugar boards. The honey bee board feeders are best for use during the winter season. They also work best in spring season as well, compared to the entrance bee hive feeder. The disadvantage of the honey bee board feeder is that when it is poorly made, during the hot summer time the candy gets heated and drip onto the frames beneath. The honey bee board feeders are also known to attract ants which may introduce infection into the hive or even predate on the bees leading to loses. The hive top feeder, as the name suggests, is placed on top of the bee hive. It offers many advantages, mainly, it can hold a lot of feed for the bees so as to reduce the amount of times that the beekeeper will need to refill it, as is the case with the entrance type of feeder. The disadvantage with the hive feeder is that it usually does not work well in very cold weather. It is also cumbersome in that it takes more space than is necessary. 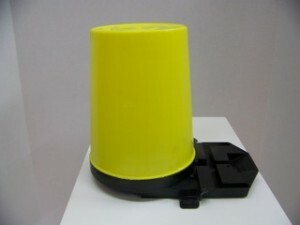 A suggestion is to use of the ordinary poultry feeder as the hive top feeder because it also works just fine. The most important thing is that if poultry feeders are going to be used to feed the bees,they must be thoroughly cleaned before any feed is put into. Bees, just like any other insects are also very prone to infections which may in the long run wipe out the entire colony in the hive. Bees need to be fed during times that they don’t have access to food supplies or when the seasons are simply not favoring them. If they are left to survive on their own, then they may just suffer from starvation. There are different options that beekeepers can feed the bees with which include the use of the bee hive entrance feeder, honey bee board feeder, and the hive top feeder. View our rankings of the best bee feeders. keep it up for alarming this beekeeping work.